This year, Jennie-O is on a mission to help families make the back-to-school transition as nutritious and delicious as possible with a variety of new tips and recipes perfect for any eating occasion. With a seemingly endless selection of great products and convenient, nutritious recipes available for breakfast, lunch, after-school snacks and dinner, Jennie-O is committed to helping make this back-to-school season the easiest yet for families everywhere. And, with the launch of the Jennie-O Back-to-School Pinterest Sweepstakes, fans have an opportunity to share creative ways to eat well with wholesome turkey meals and snacks all for a chance to win great prizes, including a year’s supply of JENNIE-O® turkey. Wait to see if they win the grand prize or one of four runner-up prizes. The Jennie-O Back-to-School Pinterest Sweepstakes grand prizewinner will receive a new tablet, which they can use to access their favorite turkey recipes, as well as a gift card for a year’s supply of JENNIE-O® turkey. In addition to the grand prize, four runners-up will also receive gift cards for a year’s supply of nutritious JENNIE-O® turkey product. Fans have until Sept. 14, 2014 to enter the sweepstakes for their chance to win. The full list of rules can be found online on the sweepstakes Web page. The brand’s Back-to-School Pinterest board will host a variety of new JENNIE-O® recipes and tips that are sure to help make the season a stress-free affair. From quick, grab-and-go breakfasts to lunchbox ideas, nutritious after-school snacks and 30-minute weeknight meals, moms and dads will have plenty of nutritious options to help their families stay energized throughout a hectic part of the year with JENNIE-O®turkey. Between preparing for work, packing lunches and getting the kids to school on time, mornings can be a stressful part of the daily routine. Parents need quick and easy breakfast solutions as they rush to serve this important meal. 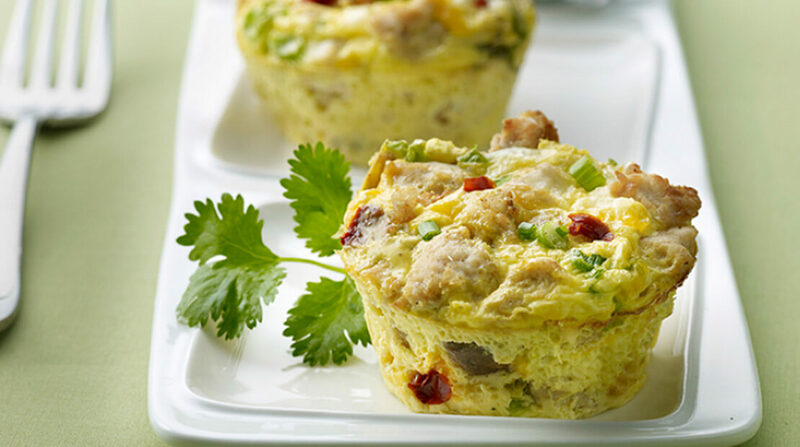 Mexican Turkey Frittatas: An excellent grab-and-go option, this recipe is made with extra lean ground turkey and filled with nutritious veggies. A great recipe for parents to make ahead of time and freeze to ease the morning hustle and bustle — reheating this frittata in the morning is as simple as popping it into the microwave. JENNIE-O® Mexican Turkey Frittatas are gluten free and include a whopping 15g of protein per serving and only 100 calories. Breakfast Turkey Bacon Roll Ups: Portability meets great taste with this convenient recipe. Made with JENNIE-O® Turkey Bacon, fresh cilantro and Colby Jack cheese, this handheld treat promises to jump-start the day with a flavorful kick. Buffalo Turkey Wraps: Ready for the lunchbox in less than 15 minutes, kids will love these spicy wraps featuring JENNIE-O® Tender Browned Turkey Breast and the ideal blend of hot sauce and blue cheese. Parents will love the recipe’s lean protein and the chance to sneak nutritious vegetables into the meal as they load the wrap with lettuce, celery and shredded carrots. Turkey Lunchbox Roll-ups: Likely to become a lunchtime staple, JENNIE-O® Lunchbox Roll-ups promise to wow student’s taste buds. Beginning with WHOLLY GUACAMOLE® dip spread on tortillas, the recipe combines sweet and savory flavors by pairing JENNIE-O® GRAND CHAMPION® Reduce Sodium Oven Roasted Turkey Breast and JENNIE-O® Turkey Bacon with pineapple tidbits for a fun, great-tasting lunch. Add cheese, lettuce and salsa and the recipe is complete in a matter of minutes. Parents can also help introduce wholesome hot lunches featuring JENNIE-O® turkey to their students’ schools or even their entire districts by encouraging them to join the Thursday is Turkey Day program, a movement to bring quality foods, sound nutrition and real-world practicality to school menus in an effort to promote positive lifestyle choices. Check out www.ThursdayIsTurkeyDay.com to learn more. By the time the school day ends and the kids are getting ready for their after-school activities, lunch can be a distant memory. While it can be tempting to offer up a bland bag of chips or soda, parents can trust Jennie-O as a go-to resource for nutritious after-school snacks that may help keep active students feeling fuller longer. Turkey Veggie Snacks: A unique alternative to ordinary after-school snacks, even the pickiest eaters will enjoy this recipe, which combines cubes of delicious JENNIE-O® Oven Roasted Turkey with sweet cherry tomatoes, refreshing cucumbers and low-fat mozzarella cheese and basil in a kabob-style snack that looks as delectable as it tastes. JENNIE-O® Turkey Ham and shredded cheese, place in the oven and within minutes the kids will be enjoying their favorite new snack. After a busy day at work and school, dinner should be a time for families to enjoy each other’s company, not a time to stress about preparing a complicated meal. From classics like turkey tacos to set-it-and-forget-it slow-cooker recipes, JENNIE-O® 30-minute meals help families to relax at the end of the day with a delicious dinner together. Slow Cooker Turkey Tacos: A new take on a classic weeknight meal, JENNIE-O® Slow Cooker Turkey Tacos are a joy to prepare and prep time for this dish is less than 30 minutes. Simply place JENNIE-O®OVEN READY™ Turkey Breast in a slow-cooker before leaving the home in the morning and by dinnertime, tender shredded turkey will be ready to serve. Fill soft tortillas with the turkey, spicy slaw with red chili peppers, and top with the family’s favorite taco fixin’s such as fresco cheese, lettuce and tomato. For some extra flavor, add fresh avocado or salsa. Turkey Lettuce Wraps: Sure to be an instant addition to any cookbook, this lettuce wrap recipe combines JENNIE-O® Lean Ground Turkey with the flavors of popular Asian cuisines — soy sauce, ginger and garlic — for an exotic weeknight dish. A great build-your-own option, Turkey Lettuce Wraps are easy to customize to fit every family member’s personal preference. Be sure to visit www.JennieO.com/sweepstakes to enter the Jennie-O Back-to-School Pinterest Sweepstakes for a chance to win great prizes and browse more creative recipes and inspirational tips. For more information on JENNIE-O® turkey products and recipes, visit www.JennieO.com or connect with the brand on Facebook at www.SwitchToTurkey.com.